Solid 14 carat yellow gold Hawaiian Plumeria (frangipani) stud earrings. Flowers feature a brushed finish and diamond cut petal edges. Post back with spring butterfly clips. A beautiful addition to your Hawaiian jewelry collection. 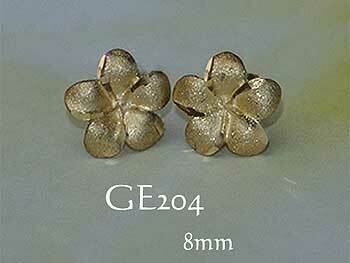 Measurements: 8mm diameter flowers. 1.10 grams weight per pair. Also available in these sizes: 12mm, 15mm & 18mm diameters. Box Chain - Solid 14 carat Yellow Gold - 40cm - 16"